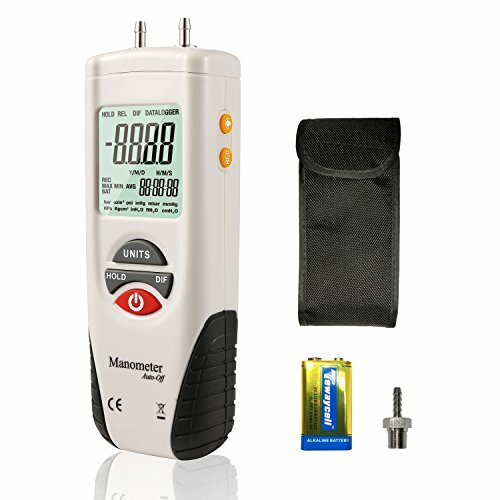 This HVAC Digital Manometer is a professional instrument to measure gauge. Offering 11 selectable units of measure, Differential Pressure Manometer can serve as a low range/ high-resolution Gauge or provide Differential Pressure up to 0 to 55.4 in. H2O (inches of water). Max/Min recording are useful features, Data Hold and Auto Power Off functions. The also features Zero function for offset correction or measurement. It is ideal for carrying out servicing and troubleshooting on air conditioning and refrigeration systems. Low Range/ High-Resolution Gauge or Differential Pressure. Measuring Ranges: ±13.79 kPa / ±2 psi / ±55.4 H2O. 11 Selectable Units of measure: inH2O, psi, bar, mbar, kPa, inHg, mmHg, ozin2,FtH2O, cmH2O, kgcm2. MAX/MIN/AVG values and Zero function. Data Hold and Auto Power Off functions. Error Codes for out of range indication. ▲[ 11 Selectable Units&High Accurate ] This gas pressure meter features 11 selectable units of measure.The device measures gauge and differential pressure in the range of ±2 psi, High resolution(0.001psi) gauge. ▲[ Date Hold & Max/Min/Avg Recording ] Press the HOLD button momentarily to freeze the displayed reading. Zero function for offset correction or measurement.Press REC button to access the MIN/MAX/AVG recording mode. ▲[ Portable ] The digital gas manometer dimensions:5.79" x 2.16" x1.26", Slim design and the easy button for one hand operation, free up a hand for other work. ▲[ Large LCD with Backlight and Auto Power Off ] The gas pressure tester will automatically shut off after 20 minutes to extend battery life. Backlight function for easily read the display even in the dark. ▲[ Multi-Application ] Specifically for use in HVAC, pneumatic controls, medical equipment, gas appliance repair and installation, laboratory testing, computer peripherals. View More In Airflow & Air Quality. If you have any questions about this product by Hti-Xintai, contact us by completing and submitting the form below. If you are looking for a specif part number, please include it with your message. Dwyer® Differential Pressure Digital Manometer Handheld, 475-000-FM, FM Approved, 0-1.0" w.c.